Sounds like a nice challenge for private desktop owners. As our Solar System happens to reside in one of the arms of our Milky Way galaxy, I suppose that there is no chance whatsoever that we will get too close to SgrA* at the centre to cause any worry. Does this increase the risk of infection of computers? "Event Horizon Telescope Reveals Magnetic Fields at Milky Way's Central Black Hole" . cfa.harvard.edu. 3 December 2015. 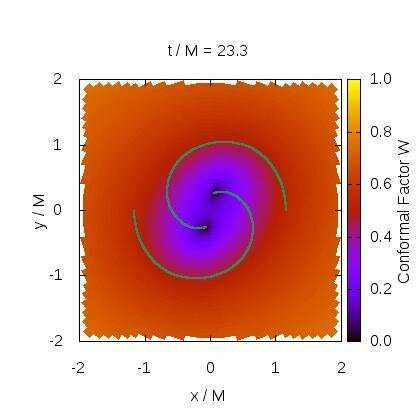 "Resolved magnetic-field structure and variability near the event horizon of Sagittarius A*"
While the rate of mergers isn't pinned down yet, preliminary estimates of the upgraded LIGO/Virgo collaboration (twice the viweing volume) claims one black hole binary merger every few days and one neutron binary merger every month or so; dunno about mixed mergers. I read somewhere they have two candidate events after two weeks. So it is an urgent area! @danR: Recycling of black hole energies works even in the case of fringe cosmologies, Hawking radiation implies these objects will eventually evaporate. Recycling of black hole energies works even in the case of fringe cosmologies, Hawking radiation implies these objects will eventually evaporate. I understand that; it's only that the final stage of heat-death, say a googolplex years from now, will mean the evaporation of all mass into energy. Not only CCC, but e s p e c i a l l y CCC... depends on this final evaporation. Finally, CCC is not only a cosmology, but a cosmogeny, and I regard all cosmogenies as fringey. Penrose' idea is one of the few that borders a gray twilight-zone of falsifiability. It shouldn't - unless the software itself is compromised, which I find unlikely. But if it's based on SETI@home then the software just moves inert data chunks to and fro.